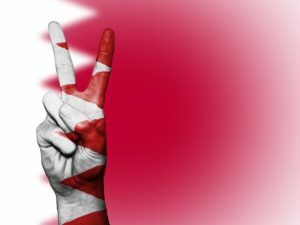 COMMENTS: Although it is the least wealthy among its Gulf sisters, Bahrain has been chugging along with a combination of its population resourcefulness, modest oil production, inflow of foreign direct investment and support from the GCC members. But things have slowed up and, for the first time in seven years, its GDP dropped slightly (1.4% adjusted for inflation). That may be small bit the other indicators are also weak. This has alarmed the IMF who immediately issued its standard cure: “economic and fiscal reforms, taxation, reduction of subsidies, etc.”. But that is easier said than done. Although, Bahrain’s economic woes have been chronic for decades, economic and fiscal reforms though necessary, take time to be effective and sustainable. The country is blessed with an industrious and qualified indigenous labor force and that should be the place to start encouraging and investing in, not squeezing savings and income by higher taxation and lower subsidies – not at this stage, at least. What Bahrain needs is a helping hand from its sisters, not more debt and interest. Such help can be in the form of more investment in such projects as the successful export-oriented Aluminum ingots plant and others. It is interesting that despite a 14.7% drop in the oil sector contribution, the non-oil sector grew 1.9%, which is indicative that not all is lost, but needs support and good management. NEGATIVE FOR: Bahrain as it is likely to suffer economically and socially, especially if real help doesn’t arrive son, and it is left to the harsh recipes of the IMF. Also, negative for the GCC, as this would weaken one of the ‘links of the chain’. POSITIVE FOR: For the lending banks and institutions that will be able to dictate their terms and guarantee long term profits or assets. Previous Previous post: Who Inherits the UK Financial Center?